I am addicted to travelling especially to the mountains.We have a lot of beautiful places in our own state namely Darjeeling,lava,Lolegaon,Rishyap,Dooars etc.There are few hundreds of places like these in other states and countries(Sikkim,Assam,Arunachal Pradesh,Meghalaya,Bhutan etc) which we need to access through New Jalpaiguri/Alipurduar/Guwahati etc. The sole purpose for starting a new thread is to gather contact numbers of the car/taxi owners/drivers.It would be of much help to everyone when we start hunting for car rentals.I faced a lot of problem every time when I tried getting adequate information on car rentals to these beautiful places.I got the inspiration from a thread namely,"Car rental in Kumaon".What I found is that we pay the car rentals on a much higher side in our own state compared to those we pay at HimachalPradesh/Uttarakhand.I felt this happens as we do not have concrete information and organised network on car rentals and as a result the taxi owners/drivers exploit the tourists at their will especially during high season(they charge just the double!! ).If we have a DataBank of drivers,taxi owners and travelers in hand providing the information on car rental details to different places then we would have much ease in negotiating the rent after talking to a few of the drivers and owners.This is a small initiative and it would only be a success if we contribute a little from our vast experience. I would request all the IMers to provide information especially if they have visited North bengal,Sikkim,Assam,Arunachal Pradesh,Meghalaya,Mizoram,Manipur,Nagaland,Tripura.Bhutan and Nepal experiences are also not to be missed. I went to Jaldapara and other places like Khayerbari,Jayanti,Buxa Jungle last December. (Driver:Raju Chakraborty,09733148212) to see the leopard rescue centre.He also arranges other Hotels for stay at Jaldapara and nearby areas including HOLONG which is quite hard to get. For our second leg of traveling we went to Alipurduar Station by Kanchenkanya (boarding from Hasimara) from where we hired an Auto rickshaw for Rs.150/- and went to Buxa Jungle Resort(WBFDC).From the resort we were taken for an evening safari(4hrs) in a Sumo for Rs.3000/- for 4 pax. Trip to Lepchajagat,Darjeeling on March 2012. Pickup from New Jalpaiguri and drop to Lepchajagat @ Rs.1400/-. Lepchajagat to Jorpokhri @ Rs.200/-. Lepchajagat to Darjeeling via Batasia loop @ Rs.500/-. Darjeeling to Chhota Mangwa via Tinchule @ Rs.1200/-(day trip). Darjeeling to New Jalpaiguri via Mirik @ Rs.1900/-. I will keep track of this thread and shall keep on adding. Thanks. Dear Asish Das,thanks a lot. I desperately needed information on car rentals and "need brings in solution" and I thought of starting this thread!! I have traveled several times with Sanjib to sikkim. His number is 09733042995. Great company, extremely hospitable and good grip of the roads! It must be containing very useful information. But I'm unable to read the attached image. There may be some way to enlarge ... but I don't know how to do that. Can you please make it larger? Thanks. Please check if you have a clear image. You can also share information like point to point fares(particularly for them who travel in shared vehicles),names & numbers of good travel agents and also bad ones(the ones to avoid!). 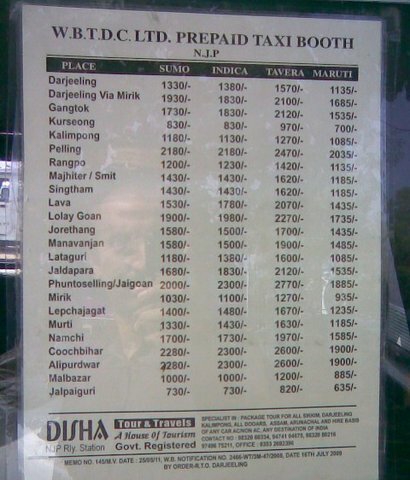 Edited and Replaced by a latest one..
HASIMARA, CHILAPATA, JALDAPARA & DROP AT SILIGURI BUS STAND. The driver was Amol Karji. The above trips were spread over 2 days and I have a feeling that price could have been brought down slightly had I bargained a little more. This was a whole day's trip. I paid Rs.1500/- L.S., which I think, was okay. Thanks a ton. Now I can read the rates. Now that's quite an information......!!! !cool:The rosy side of the fares. But we hardly get to pay this chart fares.......so please feel free to share the reality.